Since the industrial revolution, economic growth has gone hand in hand with the consumption of fossil fuels and the release of ever greater amounts of carbon dioxide into the atmosphere – leading many scientists and politicians to call now for a new, technological revolution. 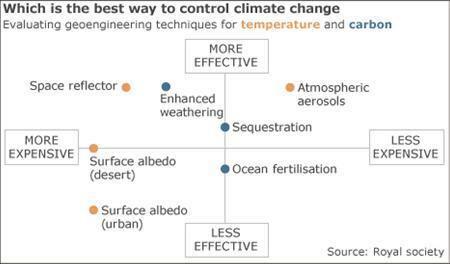 Here we survey options for power-generation and transport, and also engineering solutions to reflect sunlight or remove CO2 from the atmosphere. Range of technologies to pre-treat coal to reduce emissions, burn it more efficiently, or capture and store carbon emissions. Most abundant and widely distributed fossil fuel. Preserves existing industry and makes use of existing infrastructure. Uses more coal per kWh than normal coal power. Produces some pollutants, such as heavy metals. Coal is a finite resource. Small-scale trials under way. Huge investment(c $3trn) needed by 2050. Estimated cost: 5-13 cents/kWh (double normal coal). Uses naturally hot rocks, or temperature differences, beneath Earth’s surface to heat water directly or drive turbines. Constant renewable energy source in some locations. Highly efficient for heating living spaces. Long hardware lifetime. Underground heat only available in some locations. Energy can “dry up” for years. Can in some locations release toxic gases. Currently less than 1% of global capacity. US and Australia investing in new technologies. Estimated cost: 5-11 cents/kWh. Exploits energy of shifting tides, underwater currents, or shoreline and offshore waves. Large and infinitely renewable resource. Tidal energy very regular. Can be exploited on small or large scale. No consensus on best means to capture energy. Large projects may disrupt natural water flow, tides and ecosystems. Little expected before 2030. Technology uncertain, so wide cost range: 15-30 cents/KWh (double or triple coal). Solar Gathers energy from sunlight, using light to generate electricity directly (photovoltaic) or to heat liquids to drive a turbine. Infinitely renewable and most abundant zero-carbon resource. Silent and no effects on local environment. Like wind and marine, intermittent. Current photovoltaic designs complex; if widely used, chemicals could become scarce. US investing heavily, EU planning plant in Africa. Cost still high (13-35 cents/kWh) but expected to fall. Price of solar panels falling. Generates electricity by damming water and constraining flow through turbines. Most widely deployed renewable strategy. Well-established as a large-scale energy source. Can also be used for energy storage if run in reverse. Dams disrupt ecosystems and are a public health risk if they burst. Can trap decaying matter that creates pollution. One of the cheapest forms of electricity. Development focusing on small hydro-electric power. Estimated cost: 2-6 cents/kWh. Hydrogen can be burned in combustion engines or used to drive fuel cells that combine it with oxygen to produce electricity. It’s clean – the only waste product is pure water – and it’s the most abundant element in the universe. Hydrogen production is energy-intensive, often using fossil fuels or biomass. Flammable nature raises storage and transport risks. It’s too early to give an accurate estimate of cost. The US National Research Council says $55bn needs to be spent on R&D. Road, Rail, Ships, Air Fuels made from plant matter or organic waste. Bioethanol, from sugar-rich crops such as maize, used in place of petrol. Biofuel blends can be used in existing cars. Second generation fuels will make use of waste biomass such as seeds or husks. Growing and cropping biofuels burns carbon – maybe more than they save. Grown on arable land that could be used to grow food. Cost comparable to petrol – sometimes cheaper, depending on oil price. Effect on food prices needs to be factored in. One way to do this is simply to reflect more of the sun’s light, changing the Earth’s reflectivity, or albedo. This could be attempted using vast, flexible space reflectors (1) placed in orbit around the Earth. 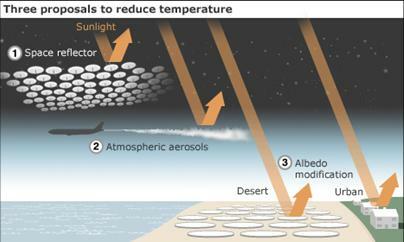 Alternatively, various types of “stratospheric aerosols” could be released in the upper atmosphere (2) to scatter some light back out into space. Earth-bound reflectors (3) could do the same. This could be done by “fertilising” the ocean , stimulating the uptake of carbon by surface algae that would eventually sink to the ocean floor. Exposing the surfaces of carbonate and silicate rocks in “enhanced weathering” could provide a place for carbon to be absorbed. 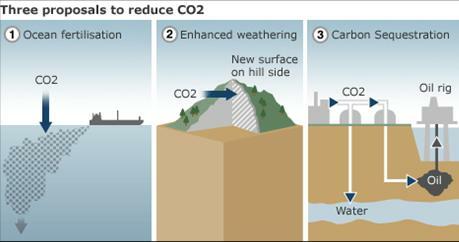 Schematic showing both terrestrial and geological sequestration of carbon dioxide emissions from a coal-fired plant. Según Wikipedia.